We don’t need a map is a major new exhibition celebrating the distinct and joyful visual language of the Martu and their connection to country. This expansive exhibition, taking place at the Fremantle Arts Centre (FAC) until January, provides an insight into Martu life and cultural practice, capturing the humour and spirit of the Martu people and providing an opportunity for urban audiences to immerse themselves in the sights, sounds, smells and tastes of desert life. The Martu are the traditional owners of a vast area of the Western Desert, covering over 20 million hectares. We don’t need a map is a celebratory statement that expresses their deeply embedded understanding of the Western Desert and their layered interpretations of the land. The artworks, artifacts and events of We don’t need a map range from significant paintings documenting Martu culture to illustrative snapshots of daily life – such as camel hunts and community football matches – painted by younger contemporary artists. 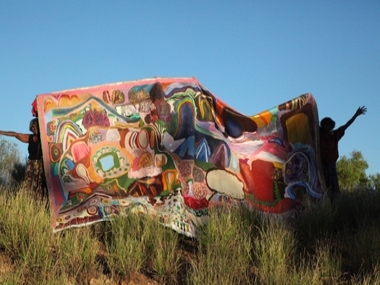 The painting component of the exhibition includes the spectacular 5x3m Karlamilyi painting by Lily Long and Amy French, a complex work filled with information about journeys through country, ancestral beings, animals and plants, waterholes and other sites of significance connected to Amy and Lily’s country. Alongside this, more than 30 paintings and drawings have been selected to explore the Martu’s experience of the Western Desert, works that have been chosen to explore significant sites and themes such as the use of fire in land management practices. We don’t need a map has commissioned a number of new works that are the outcome of extensive collaborations between Martu and non-Martu artists. 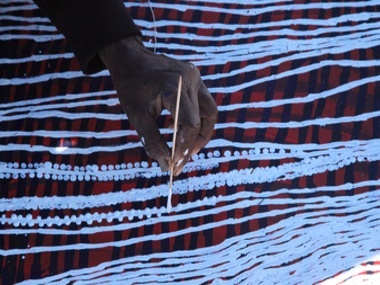 These collaborations bring Martu artistic skills and knowledge to a new community of non-Martu artists, while different artistic perspectives and techniques are brought back to the community and incorporated into the always growing and adaptive Martu practice. The Phone Booth Project, by Martu filmmaker Curtis Taylor and Melbourne visual artist Lily Hibberd is a multi-channel video installation which celebrates the robust, adaptable and colloquial aspects of daily life through the public phone booths central to communication between communities. Yunkurra Billy Atkins' animation sees Martumili’s most senior artist’s striking visual vocabulary - dramatic stories of cannibal babies, ancestral weaponry and dangerous country - brought to life by internationally renowned multi-media artist Lynette Wallworth, who is fresh from creating artwork for the London Olympics. Kanyirninpa Jukurrpa (KJ), a Martu controlled organisation based in Newman that seeks to build strong, sustainable communities based on Martu culture and knowledge, is providing land interpretation and mapping material for the exhibition. KJ Ranger teams combine traditional land management practices with contemporary environmental monitoring, linking the knowledge embodied in the paintings with sites, species, stories and landforms. KJ will also contribute to the public program Martu Mob at FAC, as their rangers and Mankarr workers talk about caring for country. “The senior Martu artists are looking forward to participating in the project with their children and grandchildren, many of whom are Rangers with KJ. Jigalong artist Dadda Samson said how proud she is that her son is a ranger and her granddaughter is an artist, and they will all be at the exhibition working together”, said Gabrielle Sullivan. The exhibition will also include a collection of Martu cultural objects, including wooden spears and finely wrought baskets. 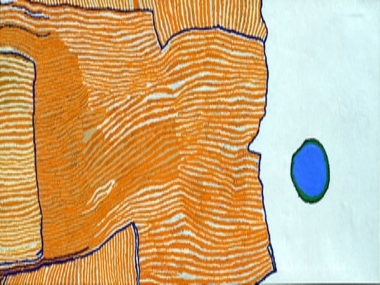 These objects show the blending of traditional skills with new materials and techniques explored by the Martu. To celebrate the exhibition, FAC is growing a Pilbara garden at the entrance to its grounds. Working with Pilbara flora experts, ground staff have brought 22 tonnes of red Pilbara soil to FAC and begun propagating and seeding various species of Pilbara plants. The Pilbara garden will provide a direct experience of the colours and flora of the Western Desert. Jim Cathcart, Fremantle Arts Centre Director said “FAC is proud to be partner in this first-time collaboration between Martumili Arts and KJ, with substantial support from BHP. FAC will be alive with Martu people sharing their distinctive view of land and life from the Western Desert, and the new works commissioned from indigenous and non indigenous artists working together might just point the way forward for Australian art”. Meanwhile, a new gallery, workshop and accommodation is being built back in the Pilbara for Martumili Artists with yet more funding from BHP - $4m – almost matched by a WA Government contribution of $3.5m from its Royalties for the Regions Fund.